This shows the total number of agents and rules defined in the document. This includes currently disabled agents and rules. An alias of a note with a rule adds to the rule count as the rule is evaluated in the agent context as well as the original. The agent and rule 'progress bars' show a moving green line. This indicates the where in the agent or rule cycle execution is currently occurring. The horizontal position relates to the $OutlineOrder position of the item in question, as opposed to a proportional place in context of the number of rules or agents. If, for example, all rules are in notes in the middle of the outline order, the rule line will cycle but only through the middle part of the progress bar. The speed of progress indicates how fast or slow the cycle is running. If no defined items are active, the line for that bar will be static - otherwise no movement may imply an agent or rule that has hung. 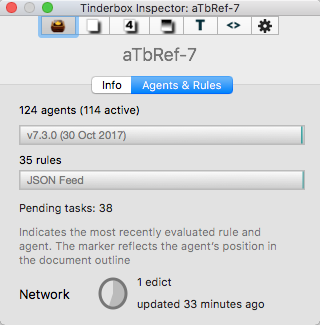 The agent progress bar list the number of agents and in parentheses the number of agents currently active. The latter is useful in fine tuning performance in complex documents. Note: the rule count is the total of notes with rules and all of their aliases: a note with a rule that has three aliases adds four rules to the overall rule count. Each progress bar shows the title ($Name) of the currently executing item to help give an indication as to the scope of execution. If automatic agent updates have been disabled, the agent bar shows the caption 'manual updates only'. Network. The control to the right of the caption shows synching is in use and its status. This process covers AutoFetch, watched folders, DEVONThink watched groups, geocaching updates, Simplenote synch, Bookends import updates, and other periodic maintenance. The processes described start as the progress reaches the 12:00 position (top centre). Edicts. To the right of the Network control a label indicates the number of edicts in use. If any edicts are present it shows beneath how recently they were updated.